Utforska Chiang Mais färgglada nattmarknader med en lokal på en 2,5-timmars kvällsmatsturné av staden till fots och av songthaew . Ta en aptit för denna smågrupps Chaing Mai mattur, som innehåller prover av åtta matvaror, med hämtning och avlämning på ditt hotell i Chiang Mai. Börja med hämtning på ditt boende i Chiang Mai, träffa sedan en liten grupp medhjälpare. För en mer personlig upplevelse är gruppens storlek begränsad till åtta personer. 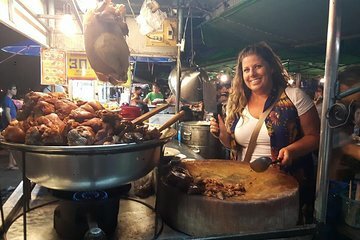 Följ en rutt som tar dig till två kvällsmarknader där du kan prova ett brett utbud av rätter, från kannom jin kinesiska nudlar till norra thailändska specialiteter, kokosdumplings, stewed fläsk och sötsaker. Det här är den perfekta tiden att lära sig några grundläggande fraser med hjälp av en lokal, och öva sedan att beställa rätter på thailändska. Turnén innehåller en broschyr som förklarar de mest populära gatunätterna, så att du kan fortsätta att utforska thailändska marknader på egen hand. Med en liten grupp och en erfaren guide har du gott om tid att ställa frågor om okända livsmedel, ingredienser och hur man äter några av Thailands mer exotiska rätter. När du har smakat dig igenom båda marknaderna hoppar du en songthaew för resan till ditt boende där den här turen avslutas. We really enjoyed the tour. The food was good, and we got a lot of it! Our guide (Jai - sp?) was fantastic! Brilliant tour, so much food. Our guide , Sunny, was very friendly and accommodating. Don't eat at least a day before ! Our guide was Son(sp)and our group only consisted of 3 people so it was very personalized and attentive. He taught us how to order and we ate some great food from stalls we would normally pass over. The mango sticky rice will be the best version you will ever have in Thailand! We had so much food so please go hungry because you will leave bursting at the seams. Highly recommend this tour!! Tour was excellent and a nice way to learn more about the food traditions in Chiang Mai. We saw two markets, tried so much food, and it was all delicious. I wish I had taken this tour earlier during my trip to Chiang Mai as it would have been helpful! We learned some words/phrases, took our own attempts at ordering in Thai, and had a great time getting to know each other. There were definitely dishes I would not have thought to try without having taken this tour! It was also nice because the group was small - just 3 of us plus our guide and all of us were solo travelers. Really appreciated that! What a great tour. We booked this tour to get a flavor for what kinds of foods are best to get from the night market street vendors and to pick up some of the local language to order food. Our tour guide Boon was a fun guy and we had a great time. There was certainly an abundance of food to try and oh so many varieties of dishes. He picked us up and started off by teaching us a couple of Thai phrases and how to order food. When we arrived at the market he showed us some of the ingredients used and sat us down so we could enjoy tasting things. He made sure to accommodate everyone's taste to the extent he could including spice level, allergies, likes and dislikes. We tried at least 15 kinds of foods and then deserts at two markets and several stalls. All of it was wonderful. If you take this tour which I highly recommend I suggest you come on an empty stomach and with a big appetite so you can try all the various foods. Boon also made sure we had something to drink at all times during the tour. This is a must do tour. This tour was awesome. I don't remember our guide's name but he was great and very friendly. DO NOT EAT before this tour. There is enough for dinner and then some. We also got to go behind some of the stalls and help make the food. Would highly recommend. This was an amazing tour! My guide, Sonny, provided such a thorough explanation of the different types of foods and delicacies in Chiang Mai. He was engaging and informative and let us experience so many different types of dishes, from appetizers to main courses to desserts. We samples probably a dozen different types of dishes in two hours, and even though it was all served family style, I was full by the end. I had to push myself to even try the dessert because I was so full! Definitely go on this tour with an empty stomach! Small group tour taken to various market areas not only to sample the local food but also a light hearted approach to ordering food in Thai. Our guide was very genuine providing information regarding the food consumed but also some of the history of Chiang Mai. Very enjoyable evening.